Archive by category "Home Improvements"
The first things that come to mind when you think about environmentally friendly living are recycling and gardening. Would you believe it if you were told that plumbing can also be sustainable? Sure, it’s not the first thing that pops into your mind when you think ‘world greening,’ but think of water and the cost of that as a utility. Your home plumbing, utilised for sustainable living, can have some enormous benefits. If you look at the broader picture, energy conservation and waste reduction are all part of sustainable plumbing practices. The end game is that the equipment already in your home, and adapted differently, can be used to reduce waste. The choice of pipes, low-toxic fixtures and equipment that are made locally (if possible) and ethically, all add to the growth of sustainability. 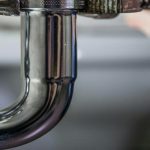 You can also consider how plumbing has an overall impact on the environment. It’s not always the job of plumbing professionals to be environmentally conscious. There are some neat ‘green’ plumbing tricks you can use on your own DIY projects. Cleaning around the house doesn’t have to be a chemical party. Use vinegar, bi-carb and lemon for different cleaning jobs. Environmentally much safer and a heck of a lot cheaper too. Environmental plumbing means being water-wise too. Rain water that usually runs down the drain can be diverted to your garden. Watering the garden in the cooler part of the day is another basic water-clever idea. Your dishwasher and washing machines should have the highest energy rating and lowest water usage. Every little bit helps. You can go crazy with enviro-plumbing if you really wanted to as there are lots of small but effective changes you can do around the house. Start with leaky taps, then insulating your water pipes and follow up with mulching your garden to keep the soil damp for longer. When is the best time to start the project? Do you opt for roll on turf or grass seed? If you opt for a roll on lawn, it can be installed almost any time of the year in Australia, unless you live in a really cold or wet area. Example – Tasmania. If you decide to spread a few seeds, then you would be well advised to do this when spring has sprung. Warmer soil temperatures certainly aid germination. The ground preparation for both options are rather similar and a critical requirement. 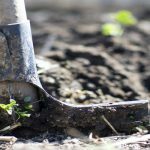 Obviously, planting grass seed is a long-term solution, and if you haven’t done your groundwork (pun intended), then the ominous march of weeds will soon begin and be competing for moisture and nutrients. It can take months for a seeded lawn to become established and turn into a hard wearing, firm, and attractive grassed area. Roll on turf though, takes just a few weeks to become established. It is capable of withstanding kids playing on it within 2-3 weeks, and certainly after a month, you can set up the stumps for a game of cricket. The big advantage and a preference for many people selecting to use roll on turf is that it has the finished look after Day 1. Both options have the same aftercare from installation – keep off it and keep it moist. It might be an idea to spray the old grass with a strong weedkiller before you start. Remove the old lawn. Use a flat spade, but if you have a large area then hiring a turf cutter is the best solution. Remove stones, big chunks, and other debris. If you are looking for home improvements that will save you money in the long run, you can’t go past the ‘green’ or eco-friendly type. Often these kinds of improvements are not even that expensive when compared to others such as upgrading the kitchen or bathroom. So if you are not looking to hire a removal company such as Brilliance Removalists Melbourne just yet but are content to stay put, make your home cost-effective by considering to these suggestions. If you need to have lighting outside, solar lights can really help light up the way as well as spotlight your feature plants. Garden lights that have a little solar panel in the top are really inexpensive and add charm to the garden. Upgrade your old appliances. Most older appliances are just not energy efficient. You’ll notice the difference in your power bill once you have new ones. Most will also be water efficient, giving you a double savings. Be sure to look at the star rating labels on the outside of the appliances to ensure they are truly efficient. Call a good electrician and upgrade the lighting to LED or other energy efficient lights. The initial cost will soon be recouped by the savings in the cost of power. Plus, the bulbs will last much longer, so you will save on the cost of replacements. Consider solar power, but do your research carefully to make sure it will really save you money. Only if you intend to stay in the home for over 5 years will getting that loan be worth it. Of course, if you can pay for it without getting a loan that will certainly save on the cost of the interest. Every person who cooks in the kitchen will recognise the need for good kitchen design according to Kitchen Professionals. It is very likely the dream of every housewife to have a modern kitchen with lots of bench space and storage. But the design for your kitchen can also be environmentally friendly and when it is, it will save considerably on the costs of running the home. Most kitchens in older homes were not designed to be ‘green’ or eco friendly, but with a few upgrades you can have a kitchen that looks attractive and saves on costs as well. How? Here are a few design tips to ensure your kitchen is environmentally friendly, whether you are planning a new one or upgrading your older kitchen. Put in a larger window. This will let in more natural light so you don’t need to switch the light on in the middle of the day to see what you are doing. A larger window can also be opened to cool off and air a hot kitchen, saving on the costs of running the air conditioning or the extractor fan in the range hood. New large appliances are usually much more energy efficient than older ones. Choose only the size appliance that you need for your lifestyle, or may need in the next decade. For instance, if you plan on having children in the next few years, a larger refrigerator and dishwasher will be extremely worthwhile. But if the children are all about to leave home and you need a new fridge, you might not need a large one. Much depends on your lifestyle. When you are planning a home renovation it is very exciting, especially if it is for your own home. It is wonderful to see the change as the home renovation progresses and know that it will really enhance your lifestyle. You can be eco- friendly with home renovations during the equipment hire phase as well as in choosing building materials and finishes. Choosing the right equipment for the job is essential and will save time as well as help to reduce the impact the renovation has on the environment around you. Plant hire need not be difficult; the hiring company will help you choose the best machine for the job. You will also need to choose building materials that are eco-friendly. Bamboo is a good choice for kitchen cupboards and other built-ins. Bamboo grows quickly so it a renewable resource. You could also think about using recycled materials. There are many recycling places especially for builders and carpenters. You can find windows, doors, bath tubs, kitchen sinks and cupboards, flooring and left over cut timber from other home building projects. Why waste all that, especially when it will save money as well as the environment. When it comes to environmentally friendly kitchen design, most cabinet makers understand that newer appliances, natural lighting and no or low VOC finishes all add up. However, it is still up to the users to develop habits that are also environmentally friendly to get the most out of their kitchens. Here are some tips to help you use your kitchen in ways that are environmentally friendly. You may have chosen a refrigerator that has all the stars coloured in so you know it won’t gobble up electricity like the old-fashioned monsters of yesteryear. But if you are going to stand in front of it with the door wide open all the time wondering what to snack on, then you might be in for a shock when the power bill arrives. The same goes for the dishwasher. You might have carefully chosen a dishwasher that takes the least amount of power and water, but if you use it before it is full, you will certainly waste both. Cooking can often be done in a way that saves power too. Consider using a steamer that has additional stack-able containers. This will allow you to steam several different kinds of food using the same source of steam and only one element. Even if you boil vegetables, you can place potatoes, pumpkin and carrots in the same saucepan together, while things like broccoli or cauliflower can go on top of peas or beans. If you are designing a new home or renovating the bathroom, you may want to consider installing frameless glass shower screens. This modern bathroom trend is one that is sure to last as people find out all the benefits. One is that you can see right to the end of the bathroom so the perceived distance is greater, meaning your bathroom looks a lot larger. The beauty of using frame-less glass for the walls and door is that glass is one of the most environmentally friendly building materials there is. Of course, it doesn’t break down in landfill ever, but it can be totally reused and there is an increasing number of recycling plants springing up to do that very thing. The heat needed to remelt glass is not nearly as high as it is to make it in the first place. And the strength of glass is not compromised by the recycling process. Whatever is made from it will be just as strong and last just as long as the first item. At least some councils are now providing sorting bins for glass waste to make the recycling process easier and more sustainable. Glass comes from sand and while there seems to be no shortage of that, recycling glass is the best way to keep it out of landfill, where it can last for hundreds of years. If your company is looking for ways to be environmentally friendly, that is all to the good, because many people prefer to deal with a business that takes care of the environment. If you have to make or use scaffolding, there are ways in which you can be eco-friendly right on your doorstep. 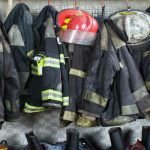 For a start, using strong steel to make it will not only ensure safety for all those who must use it, but means it will last longer. You can then deconstruct the structure after use and re-use it elsewhere. It can be used many times over and if you store it out of the weather it will last for an even longer time. This will reduce your costs as well as reducing the cost of purchasing more steel to make more. Steel is highly recyclable even though it doesn’t break down in landfill quickly. In fact, it can take years for it to rust away. But it can be melted down and reused to make many other things. Better still, this can be done over and over with the last item made from it being just as strong as the first one. It is strong, durable and needs little maintenance over its lifetime. However, it can corrode if used in a marine environment, so some kind of finish is needed to help it last longer. Powder coating or painting on a regular basis will help to keep it in top shape. Steel is rather heavy, but it can span quite a long distance without support, so it is well liked in the industry for this alone. Many homeowners these days add a swimming pool to their property to enhance their lifestyle. Having a swimming pool gives the children a reason to leave their electronic devices and get some exercise, all in the name of fun. 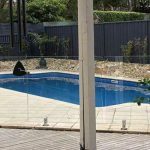 Most pool builders will tell you that concrete swimming pools have certain advantages over fibreglass. If you look around at public swimming pools you will see they are made of concrete. This is because concrete is stronger and more durable than fibreglass. While the latter does have its good points, if you want something that is going to last you would choose the former. Not all properties can be flat and even and not all blocks of ground are square or rectangular. Some have odd shapes that make it difficult to fit a pool in that comes in standard, stock sizes like fibreglass. This is where homeowners find a concrete pool more viable. Pool builders can make your concrete pool any size and shape to fit in a corner or anywhere you want it. In addition, since the pool is being designed and built from the ground up, you can have a lot more accessories such as fountains, slides and underwater lighting in it. Concrete is a sustainable product made from limestone, of which there is plenty worldwide. It can also be made out of waste products from steel mills and power plants, making it even more environmentally friendly. Security fencing is an essential part of everyday life in most western countries these days. It does a great job of keeping intruders out of certain secure areas while protecting those within, but is it environmentally friendly? Fencing of all kinds is there for a good reason and sometimes this is to protect our unique flora and fauna from harm. If such a fence is not there, plants and animals can be injured or killed from being driven over, or walked on. This may not necessarily be done on purpose, but the result is the same; the destruction of habitat and thus, of the species that need it for their survival. So it can be said that such a fence is environmentally friendly. Such fencing is usually made from wire, steel or galvanise iron, or a combination of all these materials. In many cases there may be concrete posts or footings as well. All these materials are durable and long-lasting, requiring little maintenance over the years, another tick for being friendly to the environment. There are many different kinds of fencing and what is used depends on the purpose of the fence. Commercial fencing can be made to look visually appealing by the use of such elements as limestone blocks, but in most cases a fence looks neat and tidy anyway, as it separates one area from another and defines space. It can be used to ensure foot or vehicular traffic causes the least amount of harm to the environment and can keep many different types of native or farm animals and pets separated from each other and thus, free from harm. Security fencing is also used to keep our precious children safe from wandering away and from other dangers, so it does many essential jobs well. Many types of fencing can be recycled by being dismantled and used in another location when necessary, so that too, makes it environmentally friendly. Steel and iron can also be melted down and re-formed into something else, making those kinds of fences highly recyclable. When I was younger, I wanted one day to have a Bat Cave just like Bruce Wayne. Then, Batman Begins came out a few years ago and I wanted a cave to call my own all over again. There are some obvious problems with finding such a perfect geological feature to compliment any home — so I’ve lately downgraded my dreams to building the perfect eco hideout instead; the type of place I can wander through backyard woods or across a field in the middle of nowhere to get to. The type of place where you can hunker down for a few weeks at a time and not worry about looking like Tom Hanks halfway through Castaway. Modern, earth-friendly, and cozy — with all the high-tech renewable energy systems and gizmos I can cram into it. Think Thoreau’s cabin at Walden Pond but with an Xbox360, skylights, and solar panels. 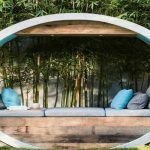 Below are four “Eco Spaces” that are unique and perfectly designed to give you the privacy you need without losing any of the comforts. Some are easier — and less expensive — than others, but the end results for all are striking.